One of the most common myths about salt consumption is that reducing your salt intake to the least amount possible is essential to a balanced diet and healthy lifestyle. In fact, consuming too little salt can be just as dangerous having too much, with the potential to cause a life-threatening condition known as Hyponatremia. For some people, not having enough salt in their diet can have other unintended consequences on their health and wellbeing such as hypertension and cardiometabolic disease. In a recent study, researchers at Boston University School of Medicine found that participants (who all started the study with normal blood pressure) consuming less than 2500mg of sodium a day over the next 16 years, actually had higher blood pressure readings than those who consumed more. Dr. Lynn Moore, Associate Professor of Medicine at Boston University School of Medicine, explained that her research team ‘saw no evidence that a diet lower in sodium had any long-term beneficial effects on blood pressure’. She also clarified that whilst some people are sensitive to salt and, as such, can benefit from lowering sodium intake, this only applies to a subset of people. 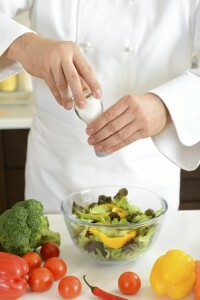 The evidence suggests that individuals respond to salt in different ways and, for the majority of people, it is vitally important to ensure that they are consuming enough salt as part of a balanced diet. The NHS guideline for adults is 6g of salt per day (equivalent to 2400mg sodium), which is needed to maintain the healthy function of body fluids and muscle and nerve activity. You can find out more in our blog post where we explain why salt is essential to a healthy diet, and the benefits it can provide to your wellbeing.